Step-by-Step Yoga for Pregnancy is an excellent guide to all aspects of prenatal yoga, from physical postures to pranayama and meditation. Teasdill discusses the implications of pregnancy on yoga practice at each step of the way; she makes the poses fresh for those already familiar with yoga, and her warm tone is encouraging for new beginners without being overwhelming. This nicely illustrated book is appropriate for new students as well as experienced practitioners. 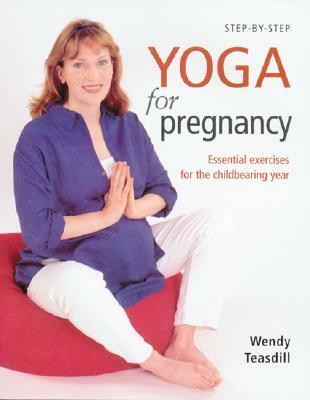 In chapter 1, Teasdill begins with an overview of how the body changes during pregnancy and how yoga can facilitate good health; chapter 2 discusses some yoga basics and describes how yoga can be beneficial in everyday life. Chapters 3-5 detail the physical asanas appropriate for each trimester, with drawings and descriptions of how and why to do each posture. Teasdill links the asanas in several sequences to accommodate different times of day or energy levels. As the pregnancy progresses, Teasdill focuses the chapter on a different aspect of yoga practice: pranayama in the first trimester (chapter 3), asanas in the second trimester (chapter 4), and meditation in the third trimester (chapter 5). She finishes the book with chapters 6 and 7, discussing labor and birth and life after the birth, respectively, including yoga postures to help heal the body after childbirth. Teasdill explains clearly which poses are safe to do at which stage of pregnancy and offers plenty of options for modification or support with props like chairs and bean bags. For the spiritual side of prenatal yoga, Teasdill includes several nice guided meditations to foster relaxation and connection to the growing baby. Yoga teachers will find this book an excellent reference, and expectant mothers will appreciate Teasdill’s expertise, guidance, and sensitivity. Last night was the seventh time I taught prenatal yoga at EEY this spring, and it’ll probably be the last time, at least for now. I’ll be traveling for Memorial Day next week, and Sarah will most likely be ready to teach the class again starting in June. Teaching prenatal this spring has been really great for me. It showed me, first of all, that I can still teach yoga – even after a baby, even when my own practice is suffering or nonexistent – and still deliver a worthwhile experience for my students. I learned more about teaching prenatal to students at different places in their pregnancies. I learned about teaching a yoga class to just one person, too – I had only one student at last week’s class, and a different solo student at this week’s class, and in both cases I think I handled it better than I did the first time it happened. I asked the student what she wanted to work on, and then tailored the class based on her requests and the stage of her pregnancy. Last week we talked about core strength; this week, focusing energy in an active yoga practice to better facilitate relaxation afterwards. I felt much better about both of these classes as a teacher, and I really had fun with it. Overall, teaching prenatal this spring has reinforced how much I love prenatal yoga and reminded me of how much I love teaching any sort of yoga. What will my next yoga teaching adventure be? Who knows what the future holds! On Monday night I taught the prenatal yoga class, and I have to say, it felt great. I was a little nervous but slipped right back into my “yoga teacher voice” without a problem. I remembered all the things I wanted to say, and I worked them in naturally – for example, talking about the need for both strength and flexibility in the pelvic floor while we practiced a wall-assisted squat. I was able to work the wall-assisted squat into the sequence in a natural way by moving us over closer to the wall for a balance pose (with only two students, I felt like I had a bit more freedom to work with the space). I’m grateful that Sarah set a precedent for using blankets and blocks in this class, because I think props can be enormously helpful for prenatal yoga (and props aren’t typically used at all at EEY). At the end of class, I tried a new guided meditation, and it flowed nicely. I felt awesome after class, and more importantly, my two students seemed to enjoy the practice. I hadn’t taught yoga in ten months, but it felt like I’d never left. Last Monday night, I went to Sarah’s prenatal yoga class at East Eagle Yoga, with the idea that I could observe the class in preparation for teaching it in a few weeks. This was an all-around great idea. Arriving at the studio, I got to see J and a few of my other teacher training friends, who were wrapping up an earlier class. The prenatal class was great for me physically, a perfect workout for my recovering body (because I fell off the yoga wagon again: this time with an illness that led to an ear infection for YB and 3 1/2 days out of work and a possible sinus infection for me). And professionally, it was great to observe Sarah teaching. She structured the class much the way I would, but she has so much experience with and passion for prenatal yoga, so I picked up some good language specific to the needs of a prenatal class. At one point, resting in mountain pose, Sarah talked about the importance of moving between tension and ease during childbirth: the ability to work hard during moments of tension and then relax completely in moments of ease. It was only a few words, but it really struck a chord with me, since if I hadn’t been able to relax completely between contractions, I don’t know how I would have made it through YB’s birth. The other big thing I liked about Sarah’s class went beyond asana. She made time at the beginning of class for her students to talk about their pregnancies and share both physical and emotional concerns, and she shared some of her own worries as well, with her due date right around the corner. This felt so important, and it’s something I wish I’d had during my pregnancy. I’ll definitely be continuing this practice when I take over the class. Overall, seeing Sarah teach refreshed my memory on the research I did last year when I was pregnant and teaching prenatal yoga. I feel like I can do this job in Sarah’s absence, do a good job of it, and offer something worthwhile to the students. Here’s a simple yoga routine that incorporates the most helpful postures for pregnant women to do. This routine will take about 15-20 minutes if you give yourself time to linger in the poses that feel good. After losing my yoga mojo for a while, I did variations on this sequence three days in a row last week, and my body is feeling more like MY body than it has in a while. I also found this routine to be short enough and gentle enough to be invigorating rather than draining (which is how my former yoga practices all feel lately). Child’s Pose (Balasana): Take the pose with legs as wide as you need. Personally I can’t get my head all the way to the floor anymore so I rest on my elbows. A good hip opener and calming/centering pose. Cat/Cow Pose (Marjaryasana/Bitilasana): Again, it’s fine to have knees a little extra wide here if necessary. If you’re as hugely pregnant as I am, you should still be okay to arch your back like normal in cat pose, but for cow, just come back to neutral instead of curving the spine. Doing a full cow can be uncomfortable at this stage, and you want to be able to take full advantage of this pose’s benefits in relieving back pain. Also, feel free to add some movement and circle your hips around if that would feel good. Downward Dog (Adho Mukha Svanasana): Be gentle with yourself here, but don’t slack off. Down dog and plank are a lot harder these days with carrying all this extra weight, but you don’t want that to be an excuse for losing all your upper body strength while you’re pregnant. See if you can hold the pose for five breaths. It might help to bicycle out the feet here, dropping first one heel, then the other, towards the floor. This stretches out the calves, which is great if you get leg cramps in the night like I do. Standing Forward Fold: Take your feet wider than normal and don’t even try to touch the floor. Let your upper body hang, and then slowly and gently roll up to standing. This should feel really nice to your lower back. Mountain Pose (Tadasana): Pay attention to your posture and spine here. Close your eyes and allow your mind to rest. Half Sun Salutes: Move through these at your own pace, and bending only as far as you comfortably can. I found that reaching up felt really good. I’ve been doing two half salutes, but you could do four or more if you wanted to. Goddess Pose (Utkata Konasana): A great thigh strengthener and hip opener! If you’re not familiar with Goddess, see my previous post for more details on how to do it and why it’s good for preggos. Warriors: Feel free to add some warrior poses here if you feel up to it (I personally have not felt up to it lately, so no shame). Warriors (and other standing postures like triangle and side angle) build strength and stamina in the entire body. However, avoid doing twisting postures like revolved triangle while pregnant. (If you are as hugely pregnant as I am, I should not have to tell you this, because you know already that twisting your midsection just ain’t happening, but, you know, I’m looking out.) Also, with warrior poses (particularly Warrior 2), take this opportunity to check in with your posture – keep your spine straight and don’t let your belly pull you forward. Supported Squat (Malasana): Come down into a deep squat, using a wall or sturdy couch at your back for support. If squatting bothers your calves or ankles, try placing a rolled blanket under your heels to elevate them. In my squats these days, I take my feet wider than usual and my tush touches the floor, which is okay. Find a way into the pose that will allow you to rest here comfortably. Squatting opens and stretches the pelvic floor, opens the hips, and builds strength and flexibility in the legs. It may also be the best and most natural position for childbirth – so practice it!! Cobbler/Bound Angle Pose (Baddha Konasana): A nice hip opener. Feel free to just sit up tall here if bending forward doesn’t work for you anymore. You can also try extending your legs out into a diamond shape rather than pulling the heels close to your body. If you experience tailbone pressure in this pose (like I do!) be really gentle with how you sit and don’t push yourself too far – it’ll make your tailbone feel worse, and you can still get the hip opening benefits just from sitting up tall. While you’re here, try some neck rolls or arm stretches – for example, some Eagle arms can open the shoulders and back. Might as well work out a few things at once! Wide-Legged Seated Forward Fold (Upavistha Konasana): I like doing this pose because, again, it stretches my calves, which are really tight, so stretching them helps to avoid leg cramps. This pose is also one of the few seated forward bends I can still manage to do, so it makes me feel good to do it. Inversions: If you already have an inversion practice, you can go ahead and do one here, but if you’re not in the habit of doing inversions, skip it. For example, as of two weeks ago I could still get up into a shoulder stand, which is cool because I’ve been practicing shoulder stand for at least eight years, my body knows how to do it. I haven’t done headstand since last summer, so I would totally not try that at this point. If you’re going to do a Bridge pose, be really gentle with that – focus more on the leg strength than on the backbending. End your practice with another child’s pose, or with a side-lying savasana. Or possibly a nap. We pregnant ladies need naps. I realized I haven’t talked about my yoga teaching here for a while. I’m still teaching at Awaken in Media, PA, now on Tuesday nights at 6:30. Two weeks ago I hit my highest turnout with five students; last week I had two students; and last night I just had one, but that’s okay because it was Stacey and she really really needed some yoga. Kyle is still working on improvements and upgrades in the yoga space – every week something new happens (this week: marker board in the stairwell, folder holder for the yoga binder, and major progress in the third massage room). The space looks better and better every week! I’m looking forward to when he feels ready to do a grand opening and start getting some more people in the door, although if that happens in May, I won’t have a ton of teaching time left before Yoga Baby’s arrival. Last night’s odd moment: when a young woman opened the door mid-class looking for the doula training workshop. I sent her downstairs to the Wellness Center, but it must have been pretty odd from her perspective to be looking for a doula workshop and to find a pregnant lady doing yoga. I hope she comes back for yoga class sometime, I tried not to be scary. My tenure teaching prenatal yoga has now come to an end: the person who was teaching the class at EEY has now returned, so she’ll be resuming the class this week. I really loved teaching prenatal, but I have to admit I’m relieved. The Sunday morning timeslot wasn’t ideal for me, and the fact that a teacher was needed in March/April also wasn’t ideal, since I had pre-existing plans for three out-of-town weekends (friends in NJ, a business trip to AZ, and family in Pittsburgh). N was very understanding but all the travel meant that I only had the chance to teach the class three times. I was also so busy last month that I didn’t have time to research prenatal yoga nearly as much as I would have liked, and ended up relying on (1) how my own body feels during yoga right now, (2) things I have heard from my midwife, other pregnant ladies, or other yoga teachers, and (3) some things I picked up in the few prenatal classes I’d taken as a student. I’m incredibly grateful to have had this experience, though! At some point in the future, I’d really like to get some training specifically in prenatal yoga and have the chance to teach it properly. In the meantime, now that original teacher is back, I’m looking forward to taking the class with someone who actually knows what she’s doing! I’m also looking forward to going to church more often, and occasionally sleeping in and eating a leisurely breakfast with F in our jammies, neither of which is possible when I had to teach at 10:30. I’ll be really interested to see what happens to my teaching after Yoga Baby arrives. I definitely don’t want to push myself to do too much too soon, or to teach when I’m exhausted and sleep-deprived (which I’m sure will be the case for at least the first month of YB’s life). On the other hand, I don’t want to lose my confidence as a teacher, I think it would be nice to have one reason a week to leave the house, and I know that picking up my yoga again will help me get back in shape after the birth. Overall I just want to be sure to be kind to myself and not to push it if what I really need is rest. Recently I read a fantastic article about natural childbirth that really excited me and made me glad to be planning one: The Most Scientific Birth Is Often the Least Technological Birth. Then I scrolled down to view the comments, which I don’t recommend doing, because it left me feeling frustrated, disgusted, and honestly quite shaken by the strength and depth of people’s vitriol. To sum up quickly, some people strongly feel that all birth should happen in a hospital with an epidural and supervised by a medical doctor, while others strongly feel that all births should happen naturally at home. The whole long comment string bothered me enough that I wanted to respond. For thousands – heck, millions – of years, women have been giving birth naturally. This is a fact, because otherwise we wouldn’t be here talking about it. Before the advent of modern medical technology, childbirth was a dangerous endeavor: there was always a percentage of women who could give birth naturally and healthfully, and a percentage who had serious trouble. These percentages vary depending on the region and culture, but overall, childbirth was feared because you never knew until you got there whether you’d die. And what modern technology has done is to remove that fear and uncertainty by making childbirth safe for those for whom it would otherwise be dangerous. This is an amazingly wonderful thing. However, there is still, as there always has been, a percentage of women for whom a natural childbirth isn’t dangerous, and to insist on applying the same technology to this group, simply because it helped the others, is to introduce costly medical procedures that may not be needed, won’t necessarily help anything, and might introduce complications. That isn’t to say that the women who need those things shouldn’t get them – I have friends who are alive today with healthy alive children because of modern medicine, which I’m incredibly grateful for. But for some women, if it’s working all by itself, why change it? I’ve been lucky enough to have a completely normal pregnancy so far – very low-risk. Considering that I’m a vegetarian yoga teacher who practices meditation, it probably won’t surprise you to learn that I’ve planned for a natural childbirth with a midwife. I still worry about the birth – what first-time mom wouldn’t? – but I have confidence in my caregivers, in the birth center facility I’ve chosen, and in myself that I can deal with the pain. I honestly feel less scared by the idea of doing it naturally than I do about the idea of having an epidural. Personally, I feel like a natural birth is the right choice for me; yogically (because this after all is a yoga blog), I feel like a natural birth fits in well with my other life choices. In a natural birth setting I’ll be able to be in touch with my body, to move around as I need to, to let my body lead the process, and I’ll be able to control my responses to pain and manage my pain with my own mind. This path seems to fit in well with the yamas and niyamas and other tenets of yoga, which I truly believe in and follow as best I can. However, believe me, if there’d been any indication whatsoever that a natural birth could harm me or my baby, I’d be making different plans. What’s more, my birth center would immediately refer me to a specialist if any complications came up. My birth center has a very good record (approximately 500 births per year with a c-section rate of only 10% or so), but they know their target audience (healthy women with uncomplicated pregnancies), as well as their strengths and limitations. The health of mother and baby is most important, so my midwife won’t hesitate to send me to someone else for my care if a complication arises, or, if something happens during the birth, to transfer me to a hospital. That’s why my birth center is located right across the street from a major hospital with an excellent record of maternity care, so that if any problems arise during the birth, I can be transferred quickly and efficiently for whatever services I might need. The idea of a home birth really made me nervous – for trivial reasons (like worrying that I’d spend the whole birth worrying about who’s going to clean up the mess) and for more substantial reasons (that our home is 10-15 minutes away from the nearest hospital, which is not a hospital known for maternity care). Using a birth center seems like the perfect choice for me, because it will allow me to have a natural birth in a comfortable setting, attended by experienced professionals, with proximity to all the wonders of modern technology if I need them. So, going back to that original article, I think that the people making virulent comments about the cult of natural childbirth are not exactly accurate. My experience so far has been that my midwives and nurse practitioners are all eminently reasonable people, knowledgeable and well educated in their field, and worthy of being trusted to put my and my baby’s health and safety above anything else. No, natural childbirth isn’t for everyone – and two months from now, depending on the circumstances, it may even turn out that natural childbirth isn’t for me. But technological interventions aren’t for everyone, either, and each woman should be able to decide for herself in conjunction with her caregiver about what path is best for her.